A Belt and Pulley combination is a method of transferring power between a Drive Unit and Driven Unit. Example Motor and Gearbox where the ratio maybe increased or decreased to obtain the correct output speed. 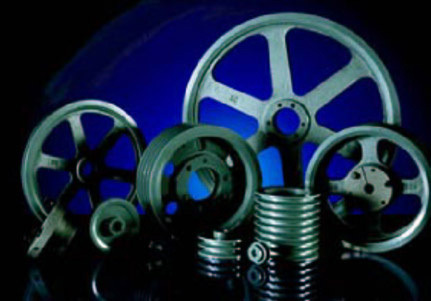 More modern engineered pulleys like the ones we distribute here at Statewide Bearings are highly precise, offering interchangeability, and come in materials like Cast Iron, Stainless Steel Polyurethane and aluminium to name the most common. Statewide Bearings can manufacture pulleys to order on request. Belt and Pulley systems are used in all industries where rotating equipment is needed. Applications include Conveyor Systems, Crushers, Compressors, Fan Drives and Pumps where speed reduction is required. Examples include pulley systems in large cranes in the construction industry as well as in earth moving machines. They are also used extensively in mining operations for all bulk material handling both surface and underground. Belts and Pulleys are used in most manufacturing industries in conveyor belt systems and any other circumstance needing a strong lifting or pulling force. Statewide Bearings supply a range of v pulleys and timing pulleys. They are available in either pilot bore or taper lock options and can be machined, if required, to fit locking elements and bore/keyway options. Our V pulleys are supplied by CAPT, adopting the international universal design. They are of the finest quality and are the most popular sold in the world. We supply standard V pulleys, tapered bore V pulleys, standard bore V pulleys, variable speed pulleys and multi-wedge rib pulleys. All our pulleys are made from S45C, GG25, GGG40 and aluminium. Statewide Bearings also supply a range of timing pulleys for high levels of efficiency, low maintenance and economical industrial operations. Manufactured by CAPT to the highest standards, they are made from S45C, GG25, FFF40, aluminium, nylon and stainless steel. The surfaces can be finished with black oxide, phosphating, anodization or zinc paint. We also supply standard bore timing pulleys, tapered bore timing pulleys, HTP standard bore timing pulleys, HTP tapered bore timing pulleys, AT and T type timing pulleys.